Why only a ÃƒÆ’Ã†'Ãƒâ€ 'ÃƒÆ’Ã¢â‚¬Â 'ÃƒÆ’Ã†'Ãƒâ€šÃ‚Â¢ÃƒÆ’Ã‚Â¢ÃƒÂ¢Ã¢â€šÂ¬Ã…Â¡Ãƒâ€šÃ‚Â¬ÃƒÆ’Ã¢â‚¬Â¦Ãƒâ€šÃ‚Â¡ÃƒÆ’Ã†'Ãƒâ€ 'ÃƒÆ’Ã‚Â¢ÃƒÂ¢Ã¢â‚¬Å¡Ã‚Â¬Ãƒâ€¦Ã‚Â¡ÃƒÆ’Ã†'ÃƒÂ¢Ã¢â€šÂ¬Ã…Â¡ÃƒÆ’Ã¢â‚¬Å¡Ãƒâ€šÃ‚Â¼" overlap, isn't more better? More is not always better when it comes to exhaust wrap. You can hold too much heat in the manifold to the point of changing the molecular structure of the metal. This can cause premature wear of the tubes or fractured welds, overlapping ÃƒÆ’Ã†'Ãƒâ€ 'ÃƒÆ’Ã¢â‚¬Â 'ÃƒÆ’Ã†'Ãƒâ€šÃ‚Â¢ÃƒÆ’Ã‚Â¢ÃƒÂ¢Ã¢â€šÂ¬Ã…Â¡Ãƒâ€šÃ‚Â¬ÃƒÆ’Ã¢â‚¬Â¦Ãƒâ€šÃ‚Â¡ÃƒÆ’Ã†'Ãƒâ€ 'ÃƒÆ’Ã‚Â¢ÃƒÂ¢Ã¢â‚¬Å¡Ã‚Â¬Ãƒâ€¦Ã‚Â¡ÃƒÆ’Ã†'ÃƒÂ¢Ã¢â€šÂ¬Ã…Â¡ÃƒÆ’Ã¢â‚¬Å¡Ãƒâ€šÃ‚Â¼" is fine as this allows just enough heat out to ensure performance without damaging the exhaust. ANSWER: You wrap the titanium dry. It the toughest exhaust wrap made. 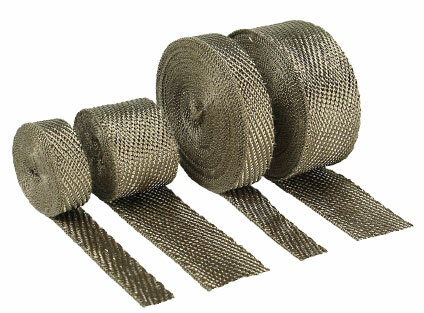 QUESTION: I am ordering the 2`` x 50` Exhaust Wrap - Titanium, the one made from pulverized lava rock. This product seems to many benefits over the fiberglass based wrap. I just have one question. Can I spray over the the titanium product with the HT silicone? This is for a custom bike and I really need the headers to be black to fit the theme of the bike but would like to work with the titanium product because of the added benefits. ANSWER: While you don't need to spray silicone over the titanium exhaust wrap, it will not hurt anything if you do.